Having leftover challah has never been a bad thing. Sunday morning brunches, Shabbat afternoon sandwiches; the options go on. Since I am hosting most Friday nights and am constantly left with challah I decided I needed to be a little more creative with the leftovers. This past weekend I also happened to have a bowl of mixed berries left over and knew right away this was the week to leave my comfort zone and make stuffed challah french toast using both these delicious remains. 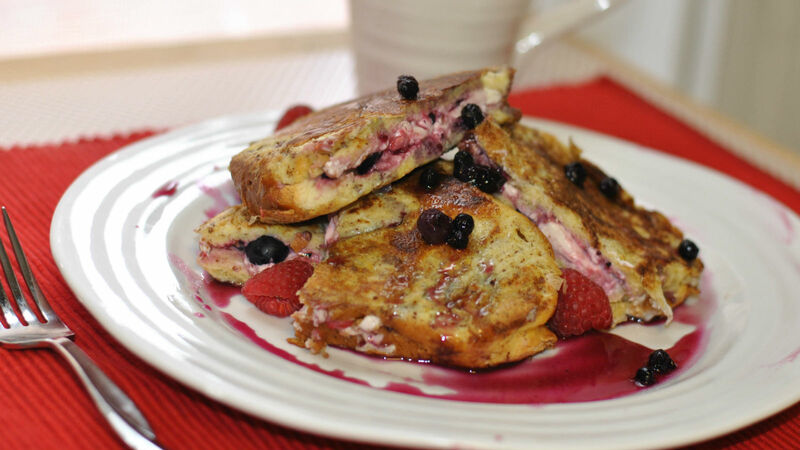 French toast is one of my favorite foods and eat it any time of day. And now that I have created this challah masterpiece, I may never stop. I even went as far as to make homemade blueberry syrup to go on top, but you can leave this step out if you prefer plain maple syrup. Slice the challah into 2-inch thick pieces. Using a paring knife, cut a deep slit across the top in the middle of each slice, approximately 4 inches long – This will form your “pocket.” Once you’re done, set the bread aside. Put the room temperature cream cheese, vanilla and mixed berries in a bowl and combine using a wooden spoon. The berries will crush a bit and that is good. Mix well. In a separate bowl, add 2 eggs, cinnamon, maple syrup, and milk. Mix well. Take the fruit-cream cheese mixture and stuff into the “pockets” of the challah. When done stuffing each piece of bread, completely coat each piece in egg mixture. Make sure all sides are covered. Put butter or oil into a hot skillet and melt completely. Add the stuffed challah to the skillet and cook roughly about 3-6 minutes on each side, until it reaches a nice golden brown. You want to make sure the cream cheese mixture heats through. Combine sugar, cornstarch and water over medium heat. Cook for 5 minutes, stirring occasionally. Add the blueberries and simmer for 10 minutes stirring occasionally. Add the butter, cinnamon and salt simmer for another 2 minutes. Transfer to a serving bowl. 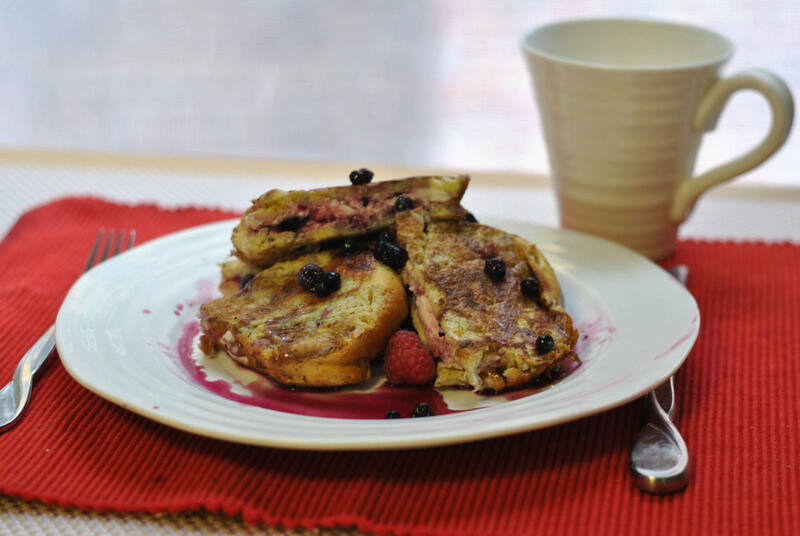 Top the stuffed French toast with berry syrup.